The craziest camel race of all time just got even crazier! The camels have to endure a longer race, but now can be powered up with the help of additional dice. Meanwhile, a renowned photographer is on the spot, patiently waiting for the craziest camel stack to build up. And last but not least, the Egyptian society has developed new betting techniques to increase profits and make the race's outcome even more exciting. 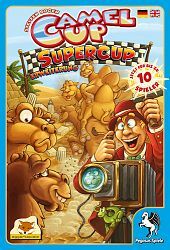 Camel Up - Supercup includes four modules for the Camel Up base game. Includes components for the 9th and 10th player.